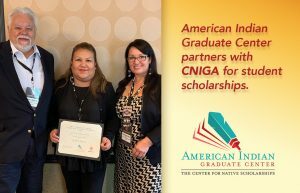 (Albuquerque, New Mexico—February 6, 2018)—The American Indian Graduate Center (AIGC) has partnered with the California Nations Indian Gaming Association to administer an annual scholarship. The CNIGA Seven Generations Scholarship Fund will award a $2,000 scholarship to an undergraduate or graduate student in California pursuing a degree in gaming, hospitality management, public policy, or public administration. Gwen Salt, a tribal member of the Navajo Nation who is pursuing a Master in Public Administration at the University of Southern California, will be the inaugural recipient of the award. Eligible students are encouraged to apply for the 2019 scholarship. AIGC and AIGCS are the largest scholarship providers to American Indian and Alaska Native students, awarding $15 million in scholarships annually and more than $200 million since inception. For 50 years, AIGC has empowered Native students from 500 tribes in all 50 states. AIGC funds undergraduate, graduate and professional degrees in any field at any accredited institution. AIGC students graduate at significantly higher rates than the national average (our SPGSF program graduation rate is 95%; our GMS graduation rate is 69 %; the NCES AI/AN graduation rate is 41%). The California Nations Indian Gaming Association (CNIGA), founded in 1988, is a non-profit organization comprised of federally recognized tribal governments. CNIGA’s mission is to protect the sovereign right of tribal governments to operate gaming on federally recognized Indian lands. CNIGA acts as a planning and coordinating agency for legislative, policy, legal and communications efforts on behalf of its members and serves as an industry forum for information and resources. For more information, visit https://cniga.com.